My summer is off to a great start already. Over the last 7 months I worked at becoming a Google Education Trainer and last week I attended Apple Academy in Cupertino, CA. I met some great people at the Academy and learned a lot about providing professional development with colleagues instead of at colleagues. 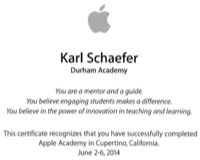 While at the Apple Academy, I learned I had been accepted into the Google Education Trainer program. As I was only blocks away from Apple HQ, and using Apple equipment, I did not mention it to anyone by Pete who I instantly connected with when I got to the hotel. I had to tell someone and besides my wife, I figured he as a safe bet. I signed the NDA (Non-Discloure Agreement) with Google on Thursday and another one with Apple on Friday to make the week a real twofer. I am so excited to be recognized by both of these leading companies who are using the wealth of resources to move education forward. I look forward to helping Durham Academy do even more with Apple’s products as I am limited to using the wealth of curriculum they provided with just my school. I plan to start an Apple Vanguard Group at school. I also know we can harness the tools and resources Google offers for Durham Academy and I am willing to work with other schools to help them as well. 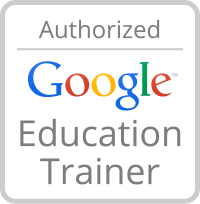 This is expected of me as an authorized Google Education Trainer. I have already worked with a few other schools and non-profits through my new consulting business Digital Karl and look forward to more learning opportunities.